Do not be surprised if your physiotherapist gives you a prescription for therapeutic exercise. This is a specific program of movement that is tailor-made for you, based on your unique assessment findings. You can’t get this from a magazine, a drug-store pamphlet or a gym; it requires the expertise of a physiotherapist who has examined you. 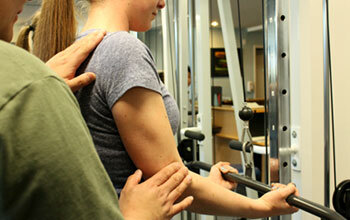 Therapeutic exercise is an essential component of most physiotherapy treatment plans. The human body requires mobility, strength and coordination in order to move freely and painlessly. When illness or injury strikes, some body parts become weak, swollen, stiff or out of alignment. The result is pain and loss of normal function. While various passive treatments can reduce pain and temporarily improve mobility, therapeutic exercise is necessary to restore the normal muscle function and control required to keep you well in the future. If your goal is to return to demanding physical work or play, your physiotherapist will likely instruct you in a conditioning program specifically aimed at regaining the strength, flexibility, endurance and coordination you need for safe return to that activity. In addition, the physiotherapist can advise you on safe techniques for work and sport, appropriate training and cross-training activities, danger signs to watch out for – all the information you need to stay healthy and active in the future.